Introduction: Timely and constructive feedback is of significant importance to honing and retaining any newly learned item. Surgical residencies are notorious for providing feedback that is limited in quantity and neither helpful nor well-timed. Among all topics taught in a surgical residency, technical skills require the most time and involve the most effort to teach, practice, and assess. This study was performed as a needs assessment prior to the enrollment of a formal technical skills assessment and feedback program. Methods: An eight question survey was delivered to both residents and faculty at a large university-based surgical residency program. The first 4 questions addressed the timeliness and usefulness of feedback including the immediacy of intra-operative feedback, performance of a post-operative debriefing, formative nature of the feedback, and the residents’ ability to improve with feedback provided. Question 5 examined resident self-awareness of technical skill aptitude. Question 6 and 7 inspected the success of the residency program in assessing resident technical skills and informing residents of technical strengths and weakness. Question 8 assessed the importance of the skills lab sessions. A 5 point Likert scale was used for each question with 4 representing the most favorable response and 0 the lowest. There was an additional comment section at the bottom of the survey. Statistical analysis was performed using SPSS (PASW) 17 including a t-test of the two groups’ means. Results: Forty-five of 67 (67%) residents returned the survey. Forty-five of 65 (69%) faculty responded. The mean responses to each question are provided in the table. The groups differed on three questions. 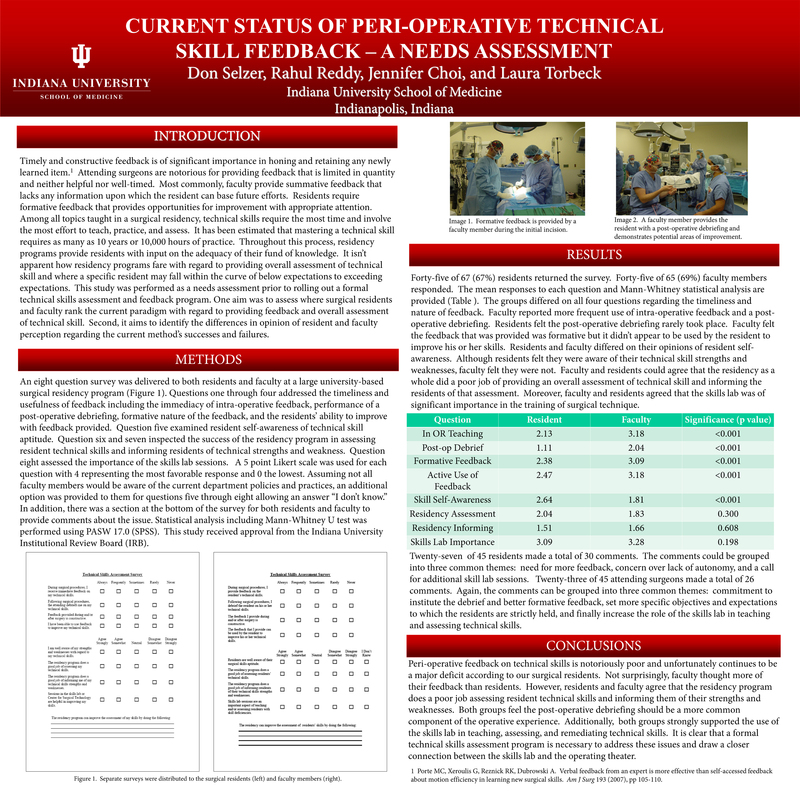 Faculty felt the feedback that was provided was not used by the resident to improve his or her skills. Albeit minimally, faculty felt the residency did a better job of assessing technical skills than the residents did. Finally, the faculty felt the residency did a better job of informing the residents of their skill aptitude. The residents and faculty agreed that a post-operative debriefing doesn’t occur often. In addition, they agreed that residents are relatively self-unaware with regard to technical skills. Finally, both groups felt the skills lab was of significant importance. Conclusions: Feedback on surgical technical skills is notoriously poor during residency programs. Perhaps not surprisingly, faculty thought more of their feedback than residents. However, both groups strongly supported the use of the skills lab and both groups felt a post-operative debriefing should occur more often. Perhaps this may improve the overall feeling that residents are relatively unaware of their technical skills. It is clear that a formal technical skills assessment program is necessary to address these issues.